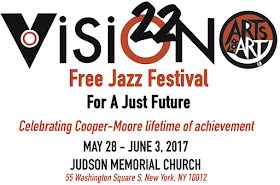 In anticipation of the 22nd Vision Festival, which takes place May 28th to June 3rd in New York City's West Village, this year's lifetime achievement awardee, Cooper-Moore, took some time to answer a few questions about his work, the award, and the challenges that artists face. Cooper-Moore is a pianist by training. After an early start to his career in his hometown in Virginia, he moved to Boston in the late 60s to study at Berklee and then to New York City in '73 while working with David S. Ware and Marc Edwards in the group Apogee. After a brief return to Virginia in the early 80s, Cooper-Moore (a name derived from the surnames of his grandmothers) has been deeply involved in the creative life of NYC. Cooper-Moore's contributions to music come from the total commitment that he makes to every sound, tone, and rhythm that comes through him into the instrument at hand. The quality of his approach to music is unique and based in his roots in the South. He was chosen by his childhood community to develop and play the music that was a part of his culture. To this day, he plays for his community, for his audiences, and his music remains informed not only by his roots but also by an ongoing struggle for Civil Rights. His music encompasses all of this and more. As with every genius, his music is the expression of the magic of Sound passing through. And so AFA acknowledges this genius who seeks to serve all who listen. What is this...? An absolutely new way in the approach of jazz! ... This is free jazz with a high level of joy in the performance but also of fun in the music itself : rhythmic complexities, some hard blowing at times, and especially the incredible interplay on these short yet to-the-point pieces. 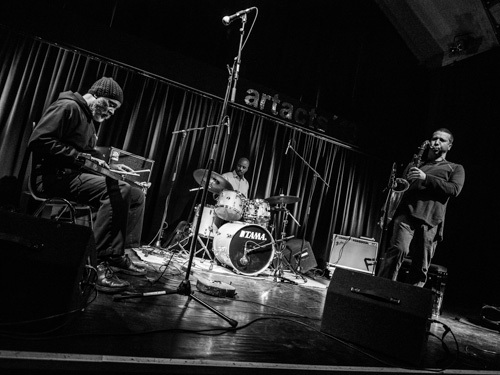 On the same evening, Cooper-Moore will also be appearing with Black Host (w/ Gerald Cleaver, Brandon Seabrook, Pascal Niggenkemper, Trevor Dunn, Darius Jones), and In Order to Survive (w/ Hamid Drake, William Parker, Rob Brown). Find out more on the Vision Festival, including the schedule of performances and purchasing tickets. I'd like to kick our interview off with your upcoming recognition at the 2017 Vision Festival ... you are being celebrated with a lifetime achievement award. How are you feeling about this award? What does it mean to you? First, I hope it doesn't mean that my life is over. There have been times when I've thought that it would be nice if I were chosen for such an award. Being chosen, I hope, is recognition by some people that I'm one of the "Cats." I've stayed on the Path. I've been consistent in my service. All those who have been honored before me have been unique individuals and unique musicians, and that is something that I have attempted to be. Being given the award puts me in good company. Arts for Art, the organizers of the Vision Festival, honor musicians from all over the world, however, they are based in New York City. Is there anything to be said about being recognized by your peers, in front of a global audience? I'm successful wherever I go to perform and work. Living in New York City and playing here is living my dream. I said before, I have stayed on the Path, and have carved out a place for myself here. And as far as "being recognized by your peers, in front of a global audience,” Dr. Jimmy Hopps said to us down at 501 Canal Street back in the early 70s, "First, make the assumption about yourself." Before being recognized as one of the "Cats," I had already made that assumption. You live the dream and you become the dream that you live. But it should be understood that the practice of living the way I do, as a musician-creative person, is a tool for becoming more human, more spiritual, more in tune with the ALL. You have been active in the New York creative music scene both in the early 70s, and again starting in the mid 80s, can you tell me a little about the changes you see in the creative music world in terms of audience, players, or even critics, over the years? The biggest changes for me are: 1. Audiences have gone from nearly all black to nearly all white, 2. The majority of the players have gone from majority black to majority white, 3. Players are subsidized either directly or through support of performance venues from institutions. When I first heard the John Coltrane Quartet in 1966, there wasn't a white person in the audience. As far as I know, Monk, Trane, Miles, etc., never got a grant. The People supported them and their music directly through attendance. Audiences have needs. Musicians who don't support the audiences' needs will not be supported by them and shouldn't be. To paraphrase Virgil Thomson, "The source of the money you live off of will determine the music that you create." Do you feel that you still have the same drive to create and play or does a continued presence on the scene take a toll? Have the sources of your inspiration changed? Some see their presence on the “scene” as a kind of competition or game. So there is the continual push to get ahead. There is the comparing of self to others. That can be exhausting. My presence on the “scene” has been minimal. The “scene” therefore has not taken any kind of negative toll on me. My presence is when I play and it is rare for me to go out to hear others. I don’t hang out. The first piano player to inspire me was Ahmad Jamal. That was August 31, 1958. Ahmad Jamal doesn't play free jazz or avant-garde, etc. But inside of what he does there is lots of freedom. He has such a wonderful touch. I always listen for touch. In 1969 I gave away all my recordings except for one LP, which was by Jamal. Yesterday I heard his new "Marseille," featuring Abd Al Malik. It is beautiful. He’s nearly 88 years old, remains modern and still inspires me. I feel the same as when I was 12 years old and first heard him play. Can you tell us a little about the musicians that you have worked with over the years? There are so many. I’ll only name a few of the Elders. Most of them few know. Emery A. Smith in Hartford, CT has mentored me since I was 16 years old. Cleve Pozar, I met in Boston. He was the first person that I saw do a recording DIY. Nadi Kamar, The first person to tell me that I “had it,” that I had it and could make in NYC. I was 19 years old. David S. Ware, I think of every day. He was someone who through all of his health issues continued to grow and to move ahead. He was a great musician. William Parker, the Poet Laureate of The Tone World and the epitome of creativity. Jimmi EsSpirit, pointed me to my future taking me into a recording studio to record my instruments played by some of NYC hippest musicians. Juma Santos, taught me about “time,” and how to count. But I have found that the non-musician collaborators with whom I’ve had associations have been more important. I pretty much knew about the music thing, but the dancers, the actors, the clowns, puppeteers, and the playwrights were the ones who taught me about performance, performing and being on the stage in front of people. In the spirit of life time achievement, what are some of your projects that you feel were most successful? Helping in 1963 to desegregate the Apartheid community in Virginia where I lived in. In the late 1960s as a community worker in the South End of Boston MA, organizing tenants to form The Columbus Avenue Tenant Association. The Association enabled one hundred and twenty poor black families to buy their renovated apartments. The founding of 501 Canal Street in June 1973, a performance and living loft for musicians. As an Artist at the Harlem Interfaith Counseling Service in Central Harlem, NYC, where seventy percent of the children did not live with a biological parent, I participated in programs designed to save the lives of children. This program was happening during the time when crack cocaine and AIDS were at its highest peak in that community. How about any that you feel did not get the attention that they warranted? Digital Primitives, Alte Gerberei, St Johann in Tirol, March 8, 2013. The Digital Primitives, which features drummer Chad Taylor and saxophonist Assif Tsahar is performing the night you receive the award. How did this group form? What do you enjoy about working with this trio? How do you define a 'digital primitive'? Assif had been working with Hamid Drake and was booking gigs for them as a duo. But Hamid wasn't available so I pushed to be his substitute. The three of us later did a trio recording called LOST BROTHER. Chad Taylor was later brought in as drummer-percussionist. What I like most about DIGITAL PRIMITIVES is that it isn't a project, it's a BAND. We all have families. We like and respect one another and we know how to push the music. The name Digital Primitives or Digi-Prims came about when Assif and I would spend weeks recording and putting together CDs. The process was one of learn as you went along. None of the early tracks were ever mastered. There would be phase problems, unequal volumes from one track to another. For Assif the important thing was to get it out there; get the recordings out there. Perfection was not a high priority. So I coined the term to label him. He then labeled the band DIGITAL PRIMITIVES. What are some of your other current musical projects? I’m writing the music for the In Order to Survive performance at the Vision Festival on May 29. I’m preparing for a solo performance in Washington DC mid-May where I play the instruments. I’m preparing to record solo piano in July 2017 and to tour it in 2018. I’m working on a documentary film score. Much of your musical work seems to be oriented to the here and now, to fleeting performances rather than to building an extensive discography. I'd like to hear your thoughts about this and why you haven't recorded more of your own music? Out of curiosity, who/what are you listening to these days? Is there anything our readers may be surprised to know is on your stereo? I am not a consumer of music. I rarely listen to music to "enjoy a good listen." Listening for me is a process of study. I listen mostly to piano music, for touch: Ahmad Jamal, Hank Jones; for two years, the Goldberg Variations by a Czech woman I don't remember the name of; I’ve been listening to Glen Gould playing Bach's English Suite nearly every day for the past 5 months; Today it's Jamal's "Marseille" featuring Abd Al Malik. He has Beautiful touch and is still relevant at 87 years old. What seems to be an important aspect of your art is instrument creation. Some notable instruments are the 3 string banjo and the Diddly Bow. How did you get into this work? What is its importance of this work to your art? I've told this story many times. It doesn't interest me to tell it again except that I build them because they come to me. They come to me from a need of mine. They are inexpensive to create. They are mine and become an extension of self so become very important. Their existence demands that I involve myself with them. When I do that it's very rewarding, so I continue to play them and play them and play them until there is a whole world of sound birthed that didn't exist before they existed, and it is good. I said before, the instruments are a tool just as music is a tool, and the body is a tool, to advance the self to something beyond. Which of your instruments will we see in action at the Vision Festival? Whichever ones shout the loudest to me that they want to come. Considering your background in education, what do you see as most vital to the younger generation in order to keep the arts interesting and vital? It is up to those who come after us to decide what is interesting and vital to them. What we can do as elders is to help the younger generation navigate the insecurities and the dangers that come to some of them because they choose the creative life. This can come about through mentoring and through counseling programs organized by those who have gone before. It is sometimes helpful for artists to have safe environments and communities in which to practice and to develop. We the elders should be available to help that happen. Young people who take the creative path need to know that they are different and that it is OK to be different. Young people who are different need to know that the creative path might be for them. We who are older should be on the look-out for those traveling on the roads that we have traveled. We know the bumps; we know the holes. In the context of the current national and international socio-political situation - and in particular the cutting of NEA funding - what do you think artists and everyone who care for the arts should focus on? I spent a great deal of time organizing and being political. I would not say that the efforts were of no value, but I would say that the time spent away from what I love doing the most, creating music and performing, did not enhance those skills. The emotional and psychological toll caused by my involvement in movement and progressive politics was high. Artists do not live in the world that most people live in. Spending a great deal of time in the creative mode can cause us to be very open and also vulnerable. Politics is ruthless and it is dirty. The vulnerable are eaten up. How about personally, with the socio-political turmoil that's happening in the US and around the world, do you feel a need to make encapsulate political messages within your music? No I don't. Sometimes it happens, but usually it's just how I feel at the time. You use the term "your music." I don’t have/own a music and have always found the phrase a little strange. The "socio-political turmoil that's happening in the US and around the world" is no different from what has always been happening; the rich and the powerful want more and the poor and the marginalized want better for themselves. I do feel a need for all of us who consider ourselves Progressives to commit to study and understand what is happening in the world. Know that, as in science, every action has a reaction, either on stage or in politics. I went to Tupelo Mississippi and played Dixie on my fife in front of a mostly elderly white audience. Quite a few of them were brought to tears. They were brought to tears because of a performance technique that I used. I went to where they were, then hooked them with a tune that they had emotional attachments. I then commenced to bend them out of shape. This was a use and expression of power over people who did not expect such coming from me. When the tune was over, I told the audience that “didn't no white man write Dixie,” and gave them a history of the tune. I keep a journal. Some of what I write I have not evolved enough to share with others; for in the practice of living I get it wrong every day, usually before twelve noon. Check out past reviews of Cooper-Moore on the Free Jazz Blog. Listen to Jeremiah Cymerman's excellent podcast with Cooper-Moore from this week. Read Cooper-Moore's bio on the AUM Fidelity site. A very good interview with an interesting person and musician. I like Cooper-Moore’s music a lot, especially his albums with David S. Ware and with Digital Primitives, the interview gives us a lot of insightful information about his ideas and his music. However, as to one aspect in the interview I don’t agree with him. 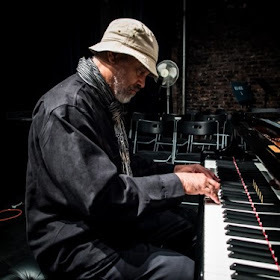 In a discussion between two sets in Darmstadt at the Jazz Center he also mentioned that he has the impression that improv musicians sometimes write music to get grants and that they have lost touch to their audience which is why there a so few people at the concerts. He said that he thought that musicians had to play music that their community want hear, in the interview he calls it “music that supports the people so that people support the music“. But an argument like that is a double-edged sword. Improvised music is not easy to digest, it challenges the players and the listeners. His argument might support views like that of Wynton Marsalis or the German label boss Siggi Loch (from the ACT label), who actually despise free jazz/improv because in their view it’s not really jazz. Loch thinks it’s music that only the musicians are interested in. It’s a fact that the audiences have changed, the question is still why (jazz has lost a lot of its African-American listeners to hip/hop and R’n’B). Considering the music of Matana Roberts for example, I’m sure it has to do with what’s happening around the people. I must admit that I have no answer to this relevant question either, but playing music which is more commercial is not the key. love this interview with the great Cooper-Moore, thank you for posting it and could the fine folks at the FJC please post more of these kinds of in-depth interviews with the artists you cover? they are fascinating, inspirational and thought-provoking. keep up the fantastic work! !